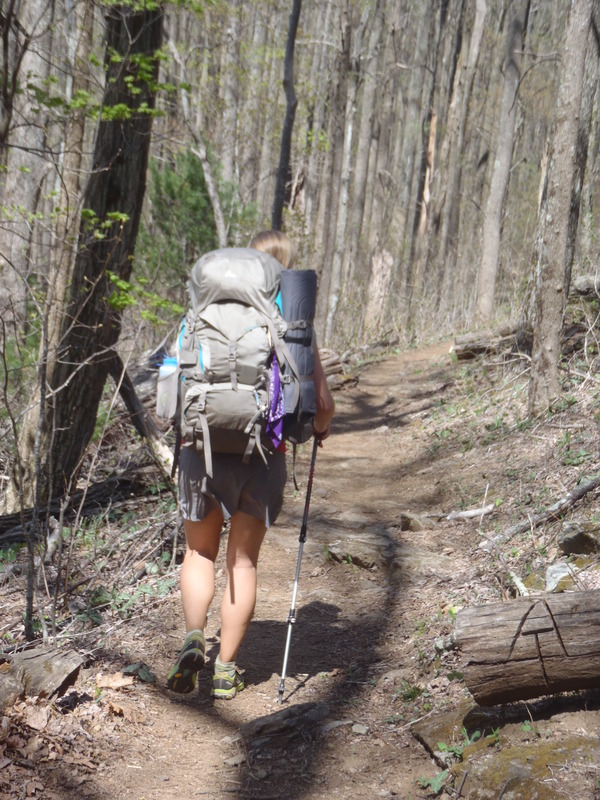 Hiking the Appalachian Trail isn’t something I’d ever considered. Ever. In fact, until recently I didn’t even know what it was. Being from Saskatchewan – the flat prairie ground in the middle of Canada – hiking was not much of a recreational activity growing up, and we most certainly had never heard of the AT. We had taken a few weekend hikes but never anything more than 50 mile when Clay told me he wanted to go on this really, really long hike. I enjoy all forms of exercise, so if a little is good then a lot is better, right? Right! 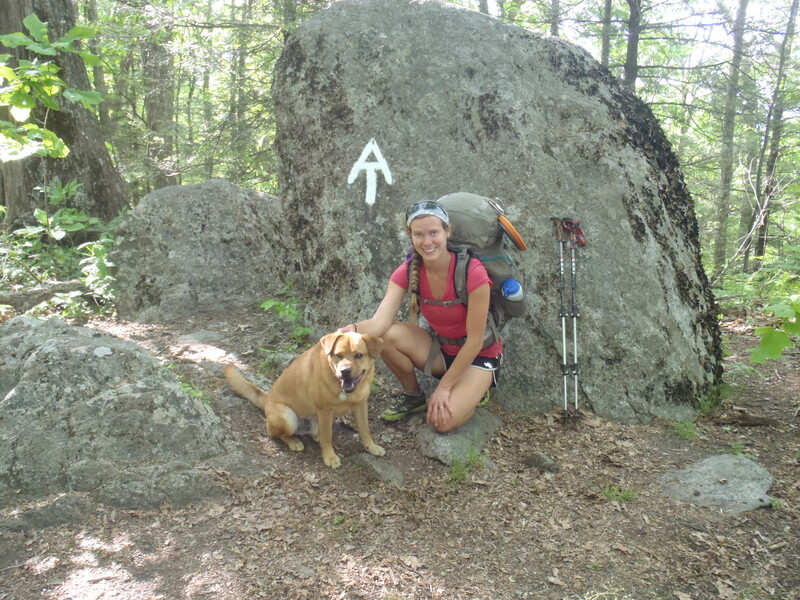 I read exactly TWO books to learn a bit more of what I was getting myself into (Becoming Odyssa and The Things you Find on the Appalachian Trail) and then we started planning our own trip! Simply put, I was hiking because my husband wanted to. Lindsay in Georgia hoping the rest of the trail would be just this easy! There is so much excitement that surrounds any new adventure, and this flow of energy carried me through the first 1/3 of our hike. I have absolutely no idea how, but I managed to endure more pain than I’ve ever felt in my feet before. I always thought I had tough feet from years of ballet, but multiple layers of blisters on my toes, arches, balls, between my toes…. I didn’t even know that blisters could grown one on top of another. I digress, you can click here to read about the Growing Pains of a long distance hike. The excitement of starting the hike made the start all a blur; I barely felt my achy feet, the weight of my backpack didn’t phase me, and neither did the day-after-day hiking. This brings me to my next point: wow, I’m stronger than I’d ever realized. Yes, I’m a strength athlete, but I mean that I’m mentally strong. 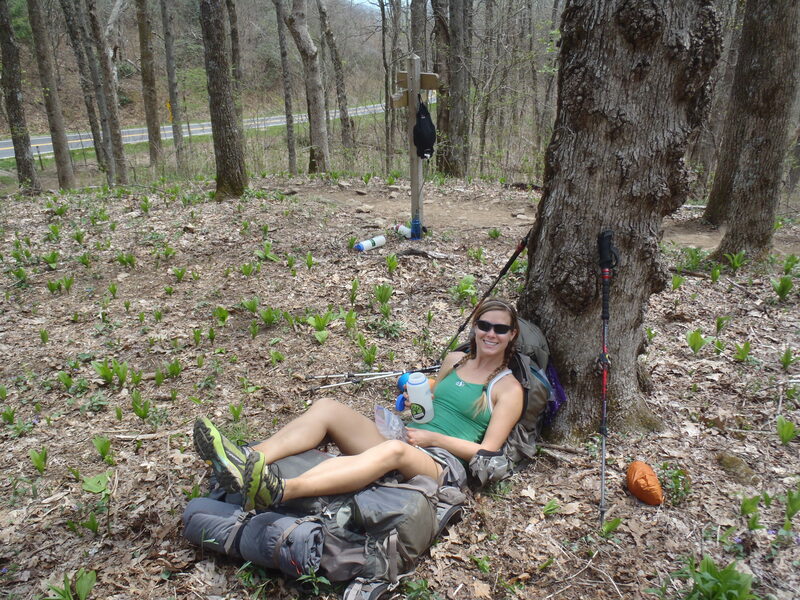 Throughout my life, I’ve managed to stay pretty well within my comfort zone, and even though I never would have admitted it at the start, the idea of an AT thru-hike intimidated me. The fact that Clayt and I were able to push on when our feet were hurting (notice the theme), or after a week of being cold and wet, or even if it was gorgeous and we just didn’t want to hike any further that day, impressed me every single time. 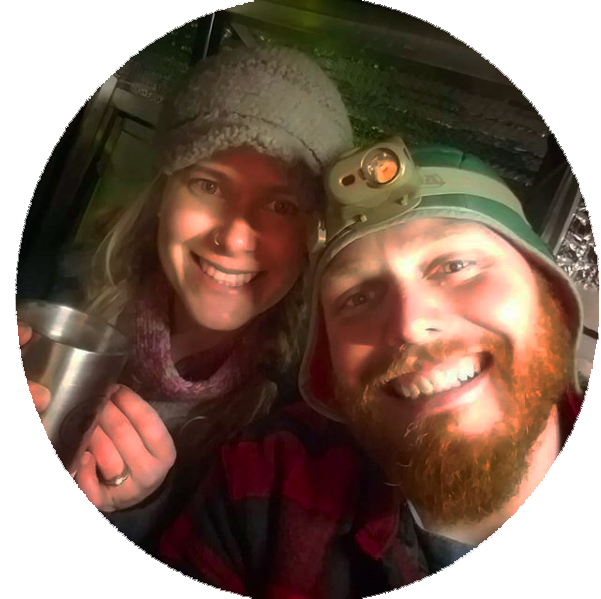 Once the newness of the trail had worn off, our bodies were broken down and hiking became monotonous, the small comforts of sleeping indoors on a rainy night or fresh food inaccessible on the trail became increasingly tempting! Fortunately if one person didn’t want to go on, the other person usually had enough drive to get both of us through the day – through the middle this was Clayt and the last few weeks I took that role. I cannot lie, finishing a thru-hike in 5 months is quick and you have to spend more time hiking than sitting around; you enjoy the views on the move and you have to be motivated. Lindsay’s feet after the first 5 days. For as tough as the trail could be at times, I had a blast. It helps that I really enjoy fresh air and the endorphin stream from constantly being active certainly didn’t hurt either. It amazed me that even the rain didn’t seem to bother me! I would have a very different opinion if we had experienced much more rain than we did, but most often we were able to dry off in a reasonable amount of time and remain fairly comfortable. In fact, my favorite part of the AT was when we entered the Green Mountains of Vermont and a rainy cold snap hit us for about a week. Vermont is already known to be muddy and the daily rain made certain we’d have plenty of it! After about 30 minutes of trying to keep my feet clean by rock/log hopping I’d slipped so may times that I gave up on the idea and just started walking straight through the mud. I felt like a little kid! I had so much fun stomping around, feeling my feet suction to the ground, and being absolutely care free. I can’t remember the last time I just let go like that. It was a bit late in the game, but in that moment I promised myself not to get too worried about anything on the trail. We were choosing to be out there and have fun. While on the AT, I had learned to not be so afraid of inclement weather. I’ve never liked being cold (yes, even coming from one of the coldest parts of Canada), I couldn’t imagine not running inside from the rain. The idea of walking to stay warm on a rainy because you’re already wearing all the clothing you had was inconceivable. After living in the woods for a summer, being cool doesn’t bother me and I won’t stop stacking firewood just because it’s lightly raining out. I learned the power of creating my own experience: if I wanted to cry about being uncomfortable then I could, but that didn’t help the situation. If I started dance-hiking and belted out any song that popped into my head, then I stayed warm, laughed, and (almost) ended the day saying I wanted the next to be just the same. 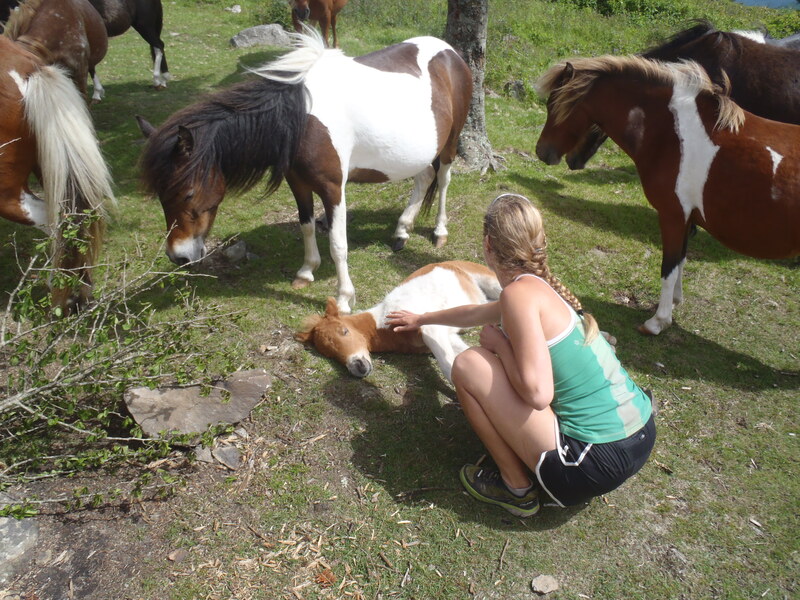 Lindsay petting the ponies in the Grayson Highlands! Admittedly, now that I have a closet full of clothes I’ll wear as many layers as I want just because I can. There’s no need to be uncomfortable if you can do something about it. Just saying. … come back in a day or two to read Part II – The Bad and Ugly.